I decided to publish this post before my official pictures came back, as I wanted to do it while it was all fresh in my mind, so these pictures are pinched from friends and family. I'll share a second post once I get the fancy photos. Weddings are BIG business, its a well known fact that if you tell a business you are getting married they tend to double the price of whatever it was you were planning to buy. I know that sounds super cynical and I know not all businesses do this, but I experienced it a fair few times first hand. 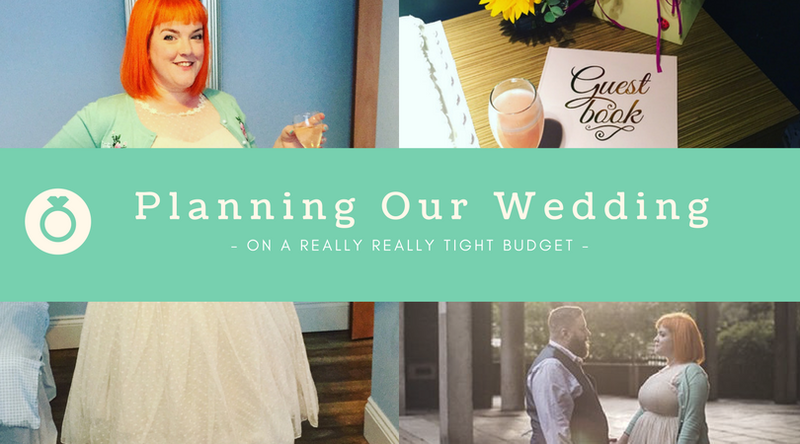 When we got engaged we were really overwhelmed by all of the wedding websites and blogs quoting thousands and acting like that was cheap. I lost count of the number of blog posts I read claiming their £7k wedding was cheap/a bargain. I felt like we might never actually get married. We had little savings and it all felt a bit disheartening. 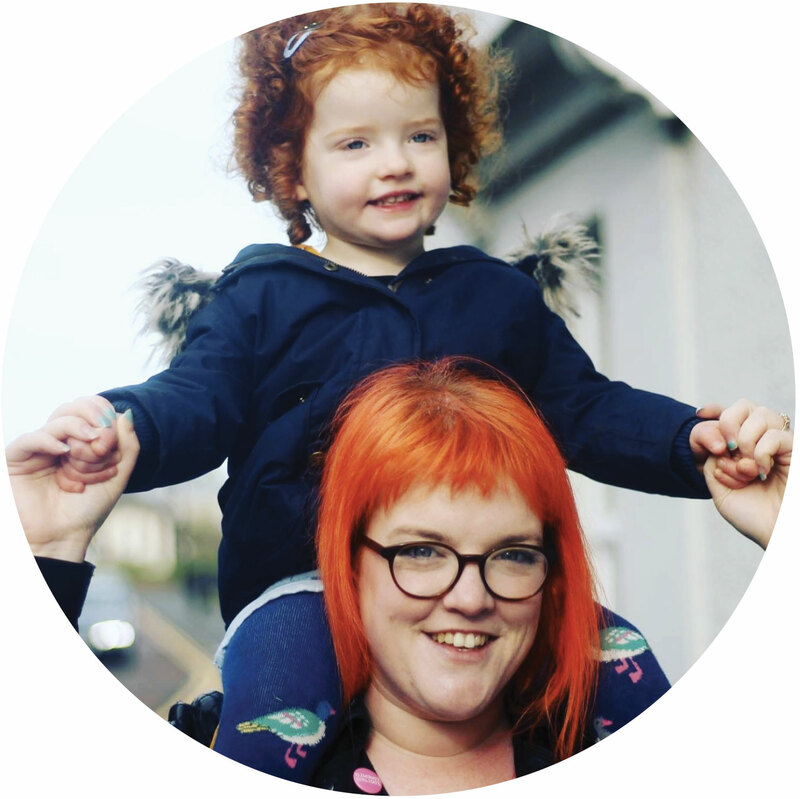 We were very fortunate that a wonderful family member gifted us £500 which helped us get the ball rolling and we embarked upon trying to make our perfect day, on a shoestring budget. We ditched a lot of the formal/traditional wedding stuff, we didn't have bridesmaids or groomsmen, or speeches, or a sit down meal, or a first dance. You can totally do these things on a budget, but for us they didn't feel needed and we did not miss them. I would strongly recommend to any engaged couples that you sit down and think about the things you really want, not just what is expected. Luckily I am a wannabe graphic designer, so I designed our invitations. We opted not to send save the dates as we were planning and getting hitched within 9 months so it seemed unnecessary, we did text everyone from out of town as soon as we booked to make sure they could make it or book travel early so it was affordable etc... We had our invitations printed at printed.com, they send out paper samples for free which was great, so we could chose the quality and colour that felt right. If you're not creatively inclined you can get some great digital designs for fairly cheap on Etsy and opt to print them yourself, which works out a little cheaper. This bit is obviously the most important, its the bit that makes everything legal. We decided to have a registry office wedding. It cost £70 to give notice (a legal must do in the UK) and £205 for the hire of a room big enough for 70 people (we had 40), the officiant and signing of the register etc... We were really happy with the ceremony, it was so lovely to stand in front of 40 of our closest friends and say those vows. The room actually had lovely fabric chairs and flowers already there so we didn't need to pay anything to decorate, and we used just plugged an Iphone into their AV system to play our chosen music. In that awful way that British women tend to do when complimented, every time someone said something nice about my dress I told them how cheap it was. Its an awful habit, but I am also pretty proud of this bargain. I picked up my dress fairly early on in the Lindy Bop sale for just £19. I paired it with a petticoat (£25) and a Collectif cardigan (£21) and some iron fist shoes (£36). 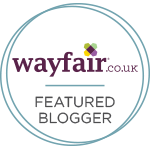 I shopped around and hunted for bargains when it came to my outfit, I stalked the cardigan for months hoping it would go into the sale in the summer, and thankfully it did just 4 weeks before the big day! Zoe's outfit was a dress from M&S (£21) with a TKmaxx cardigan (£7.99), Boden shoes (£17.50), some mothercare socks (£3), and a hairband from Claire's Accessories (£3). I was so pleased with how it all came together, I wanted her to be colourful and comfortable, which I feel we achieved. Paul is not really a formal suit guy and so we just bought a suit jacket and waistcoat from Jacamo (£78) and paired it with some chinos and shirt that he already owned, and a Zara bow tie I picked up in the sale for £5. I was so pleased we managed to get so many bargains, and all three of our outfits came in under what most people seemed to spent on one dress! I got my ring from a second hand jewellers in Newcastle for £30, its a thin band of 9ct gold, I didn't want anything too flashy as my engagement ring is pretty big/colourful. Paul got his online from Suay for £45 - he had his heart set on a black ring so went for Tungsten, I'm not a huge fan but he's the one who has to wear it. For the reception we spent a lot of time trying to decide if we should bother with a meal, or have a small family only meal followed by a party. However, the sticking point for us was that we didn't want to have people come to the ceremony then to send them away and ask them to come back later. I knew people would understand but it felt really cheap and I wasn't even sure how we would word it on invitations. Instead we decided to have a later ceremony and go straight into the evening party, with a buffet for everyone. It probably did cost a bit more than we initially planned but in the end it was worth it, and considering how much we saved in other areas, it was worth it.We hired a function room at Mr Lynch in Jesmond, which isn't a usual wedding venue, but it was perfect for us and due to them not usually catering for weddings the prices were reasonable. The room hire itself was £50, which you get back after the event. The downside of this venue is you have to use their catering, we maybe could have saved a bit more with a different caterer, but it was worth it for the hassle free night. We went for the medium £10/head option and catered for slightly less than we had attending (there was plenty left over). We also splashed out of a few bottles of prosecco for everyone to toast when we arrived at the venue. We maybe didn't need it but with not having a lot of the traditional wedding stuff it felt like a nice thing to do - I also bought a couple of belvoir cordials and some prosecco glitter for some added fanciness. The staff at the venue were incredible and I honestly would highly recommend them to anyone local to the North East. It may not look as fancy as their sister bar 'As You Like It' but it had such a more chilled atmosphere and they bend over backwards to make our day so special. For music we once again simply plugged an IPhone into their sound system, we joined Spotify premium and curated a few playlists of our favourite songs and party classics. The cake was actually £12.99 from Costco! I toyed with the idea of making one myself, but honestly I didn't need the extra stress in the days prior and I had a Costco cake at my birthday party in July and it was delicious! My beautiful friend Harriet made us a personalised cake topper which we paired with one from All Her Glory Designs. It may not have been tiered or traditional, but everyone enjoyed it and went back for seconds. In terms of decorations for the room, we bought a few banners, balloons, supermarket flowers and confetti, which added a little bit of specialness to the room, but to be honest we love the decor of Mr Lynch so it didn't need too much. As I said above weddings are big business, but its also a time where people love to help and we had so many kind offers from lots of people. I am usually quite a proud person and I hate asking for favours, while Paul is the epitome of the Geordie phrase "shy bairns get nowt", so between us we strike a good balance. I will be forever grateful to my wonderful friends and family for everything they did to make our day special.The areas where we saved money were mostly thanks to our wonderful friends. Our AMAZING photographer was my best friend's sister, so my friend gifted us her services as a wedding present, we were so grateful as we honestly were considering not having one at all looking at the cost. I do know that good wedding photographers are worth every penny, but when you are trying to stick to a tight budget it seems like such a huge amount. We also weren't going to do flowers, we inquired with a few local florists for just a simple hand tied bouquet containing a sunflower but we were quoted such varying and wild prices we felt really disheartened and a bit annoyed. One person quoted £50 then the next quoted £140 and there seemed to be no rhyme and reason to it, as soon as you say wedding the price seemed to triple. I decided that we might just grab some sunflowers from the supermarket and do something with them, but then our wonderful friend Helen offered to handle the bouquet as a wedding present and she did an amazing job, I didn't see them before arriving at the wedding but I trusted her implicitly and they were so perfect! They even did a mini version for Zoe. I may have cried. My wonderful co-workers put a little collection together as a wedding present the week prior, which I actually used to get my hair, nails and brows sorted. My hair was done by East Terrace Hairdressing in Newcastle, two weeks prior I had it bleached and dyed orange (£85), and then had a quick blow dry on the morning (£15). My brows were done at the benefit counter (£14.50) and my nails at Cover Beauty (£20). On our wedding night we stayed at the Hotel Du Vin in Newcastle courtesy of my beautiful sister. I'll share more about this is a separate post but it was wonderful to stay somewhere a bit fancy on our wedding night and the breakfast was incredible! I am so happy with how our day went, and honestly I can see where we could have spent more/less but I honestly don't think it could have been any better. It was perfect for us; low key and fun. Really love this post - you are proof that a wedding doesn't have to cost the earth. I think you all look stunning and so happy! 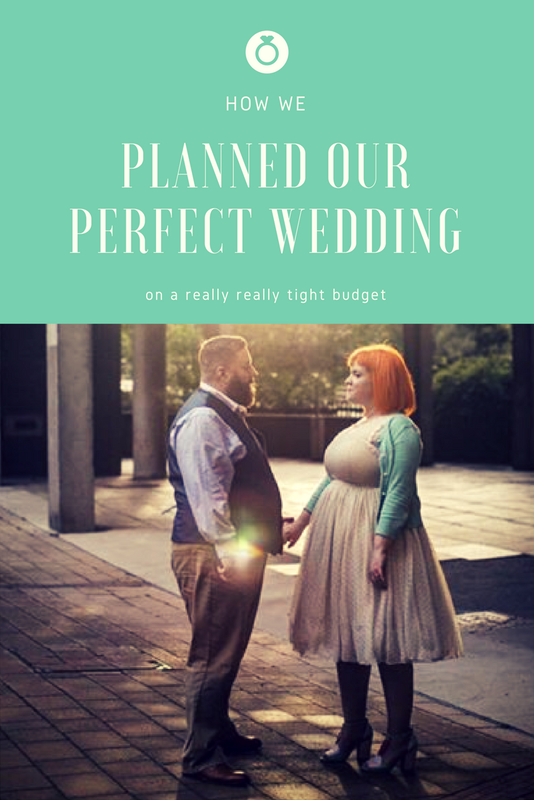 Our wedding cost a fortune and although I did really love our day, I do kind of regret spending so much now - I can't help but think we could have travelled the world instead! If I had my time again I'd definitely steal a few of your thrifty ideas - love your invites! Well done you! My sister just got married and her being up north (Me in london) I thought she would be a good indication of how much my OH and I would spend. They ended up paying MORE THAN THE DEPOSIT ON OUR HOUSE!!!!!!! It sent me into a panic but I would LOVE an intimate personal wedding like you had. The second I saw your outfits on Instagram I knew that was the look I wanted and so there's no way I will be spending over 1500 on a dress like my sis did! The wedding industry is mad and although my sis had the day of her dreams I can't believe how much they spent - especially as they are on v modest incomes! I love this. It just shows it’s totally not about the money. We aren’t married and one of the reasons why is we just don’t want to spend the money. This is totally more my style. On my friends wedding, We also wanted to have a surprise mash-up for one of our first dances and they expertly compiled the songs we wanted. I cannot say enough about how pleased we were with Floorfillas's Music Service. Oh my god! You guys are so cute! I loved the wedding invite and the cake. Thanks for such great ideas, Even I am planning to get married next year and have also shortlisted some beautiful DC wedding venues that are pocket friendly and also mind-blowingly beautiful. Totally stealing some of theses ideas. Thank you for posting this!